We take and print French passport, id cards and visa pictures following the exact specifications as provided by the Embassy of France, Consulate General of Miami and other Consulates of France. 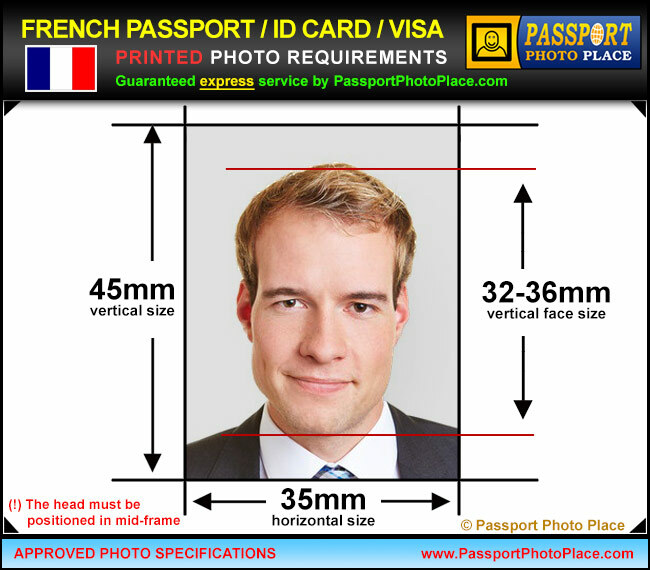 French passport photos must be submitted as printed versions. Same applies to French ID cards and Visa applications. Electronic files are not required. Embassy of France advises passport applicants and those applying for id cards and visas to utilize professional photo studio services to avoid passport application processing delays and therefore French passport, id and visa application rejections. Passport Photo Place produces pictures that are 100% in compliance with the Embassy of France provided specifications. This speeds up approval of passport, id card and French visa applications and delivery of the document on a consistent basis back to the applicant. Guaranteed French passport, id card and visa picture service. No Rejects! All French passport pictures, id card and visa photos are taken and printed by the recent specifications as provided by the applicable Embassy of France. All photographs are taken and printed by a professional legal document photographer that specializes in all legal photo documentation. Passport Photo Place takes and prints great looking photographs that naturally represent the applicants. We utilize the most recently developed photo acquisition and printing technology to consistently print pictures that are accepted worldwide by Embassies and Consulates. All French passport photos, visa and ID card photos are printed immediately and locally at our studio in Orlando, FL. The background must be light gray or light blue with no shadows and with proper contrast between background, hair, skin and clothing. White background is prohibited from use. Glasses do not need to be present in photographs unless desired by the applicant. The glasses must have thin frame and be non-tinted. French passport, national ID card and visa pictures must be printed on a high quality matte or lightly glossy photo paper at 300ppi or higher resolution. Inkjet printing is not acceptable for producing acceptable passport photos. If photographer provides un-cut pictures, do not precut them and submit along with your application. The applicable Consulate of France will cut the pictures to proper size. Please wear a solid-colored top/shirt. White or slightly off-white tops are not allowed since the background for French passport photographs is off-white and there must be a clearly defined contrast between the subject and the background. Our Orlando, FL Orange County photo studio is reachable via major routes and is in relatively close proximity from the following: Aloma, Altamonte Springs FL, Apopka FL, Apopka, Azalea Park, Belle Isle, Bithlo, Buena Ventura Lakes, Cambell, Casselberry, Casselbery, Celebration Florida, Celebration, Christmas FL, Christmas, Chuluota, Clermont, Cloud FL, Cocoa Beach, Cocoa FL, Cocoa, Conway, Davenport, Doctor Phillips, Eatonville, Edgewood, Fairview Shores, Fairvilla, Fern Park, Forest City, Goldenrod, Gotha, Hiawassee, Holden Heights FL, Hunters Creek, Kissimmee, Lake Buena Vista, Lake Butler, Lakeland, Lockhard, Lockhart, Longwood FL, Maitland, Meadow Woods, Merritt Island and Cocoa Beach, Mims, Narcoossee, Oak Ridge FL, Oakland, Ocoee, Orlando FL, Orlando Florida, Orlando International Airport, Orlando, Orlo vista, Orlovista, Oviedo Florida, Oviedo, Paradise Heights FL, Pine Castle, Pine Hills, Port Saint John, Rosemont FL, Sanford, Sky Lake, South Apopka, St. Cloud, Tildenville, Titusville FL, Titusville, Union Park, University Park FL, Windermere FL, Windermere, Winter Garden FL, Winter Park and Winter Springs.